It being January 1, 2018, it was time to go a-leveeing, and Oliver and I decided to take a different tack altogether this year, eschewing the chichi urban levees altogether, and heading west for a loop that took us along the south short of Prince Edward Island from Canoe Cove to Borden-Carleton to Kensington to Summerside to Miscouche, and then back around to Long River and New London. Traveling this “rural levee loop” gave us a chance to experience a whole different kind of levee, to suffer some unexpected disappointments and some singular pleasures. 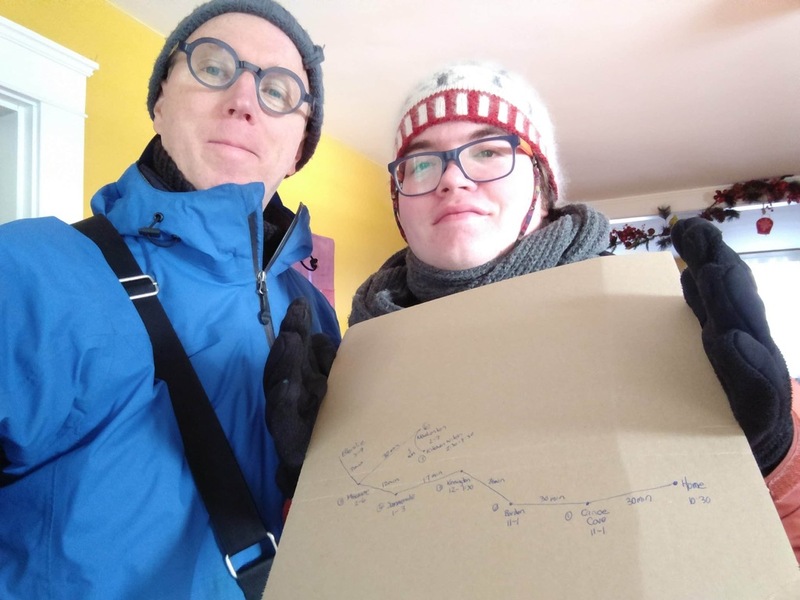 To guide us, we prepared a handy cardboard map showing the levees and their scheduled times, along with the travel distances between each. Careful readers will note that, as per my 25 year habit, I got the position of New London wrong on the map, at least relative to Long River. Along the way we covered 182 km on what might perhaps be the most beautiful New Years Day weather I’ve seen in 25 years: bright, sunny, crisp; large, you might say. I’ve been putting the Canoe Cove levee, held in the hall in this rural community 30 minutes south-west of Charlottetown on the south shore, on the list for many years; this was my first time to visit, and I’m so, so glad we did, as it was just lovely. The stuffy formality of the city levees was nowhere evident: instead, everyone just wished each other “Happy New Year,” anarchist style. 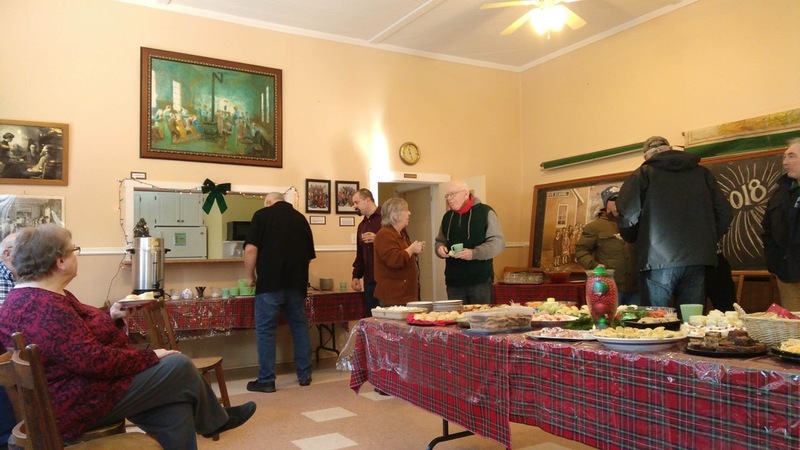 We met new friends–many of whom we had connections to already, this being PEI–and enjoyed a bountiful spread of food and hot coffee and tea, all in the congenial confines of a well-preserved historic building. If you only go to one levee, make it this one. When you’re headed to a levee hosted in the “Industrial Mall,” you don’t get your hopes up, but Borden-Carleton was also a delight. 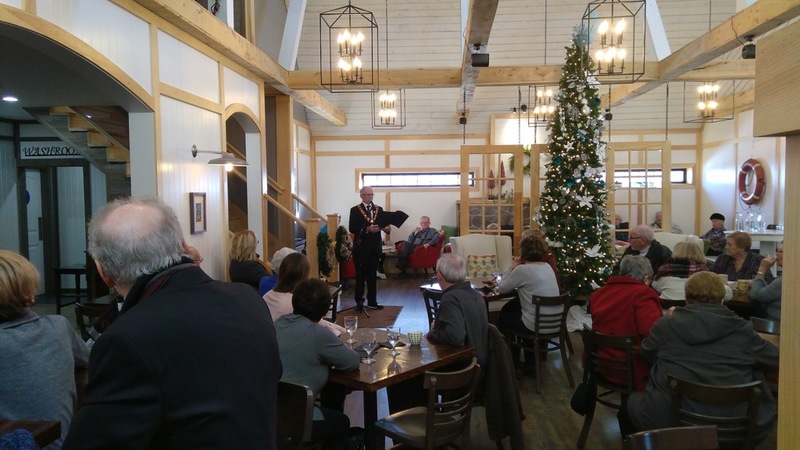 It was only slightly less informal than Canoe Cove, and that only because the Mayor, in full mayoral regalia, offered up himself as a receiving line. But he also found us napkins and forks, and told us where the coffee and tea were. There was a small but hearty group of Borden-Carletonians, young and old, gathered around a board room table piled high with food, and, despite being outsiders from town, we immediately were made to feel welcome. I learned a few things in the process. First, you don’t leave off the “-Carleton”–apparently this causes offense to those on “the Carleton side.” Second, if you’re referring to “town”–like “we’re not going to any levees in town this year”–it’s assumed you mean Summerside, not Charlottetown as that’s what “town” is that far over the Prince-Queens county line. We’ll certainly be back to Borden-Carleton’s levee in the future; and, indeed, my entire opinion of the community was raised by the reception we received. Well done! Things got a little more formal at the Town of Kensington levee, with a receiving line, and a guest book. But, being hosted at the stunning Broadway 45 restaurant downtown, it was decidedly more casual after that, with folks gathered around tables chatting, and a selection of sweets and savories on offer. Kensington was unique in that in addition to the usual business of the levee, the opportunity was taken to hand out awards to citizens in several Christmas-related categories (best Christmas lights, etc.). This was done with appropriate pomp and ceremony by the mayor, with official certificates and cheques presented. It made for a good opportunity to bring the town together in celebration, and it’s something other communities may want to consider. I hadn’t been inside Summerside City Hall in a very long time, and I’d forgotten what a beautiful building it is. 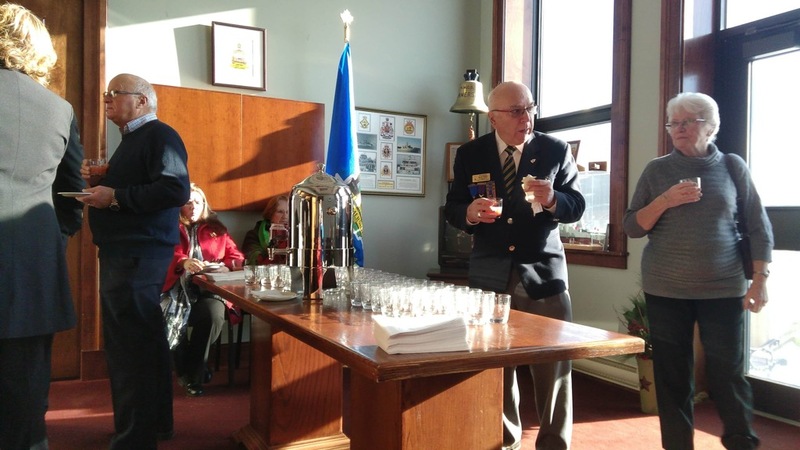 Gathered in the second-floor council chamber we found the mayor and members of council, each accompanied by their spouse, as well as two Summerside Members of the Legislative Assembly, gathered in an impressive horseshoe-shaped receiving line. Oliver really upped his receiving-line game for this one, greeting each person with a hearty “Happy New Year” and a firm handshake. Despite the presence of so much elected glitterati, Oliver was most star-struck by Lynne Lund, Deputy Leader of the Green Party of PEI, who was huddled in conversation across the room from us, and I was chastised for rushing him back to the car before he got a chance to wish her well for the year. Summerside also deserves credit for serving the best punch of the day, dispensed from a silver pot in a light-filled front room overlooking downtown. When it comes to determining what goes on the levee schedule, I’ve always used the “if you call yourself a levee, then you’re a levee” rule, and that means that a wide range of formats and facilities end up on the list. 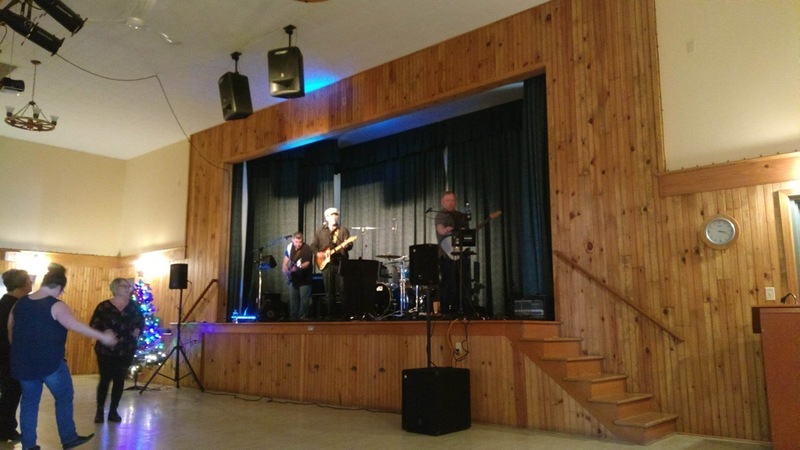 The levee at the Miscouche Legion looked like a rollicking good time, with a live band and teaming revelers in attendance; alas we were turned away at the door, as it was a “19+” event, due to liquor regulations. This will prompt me, in future years, to add a “are you an all-ages event” question to the yearly query I send out when assembling the list; I’ll still include all the levees, I’ll just have a column on the schedule to indicate which aren’t friendly to everyone. Getting kicked out (by very friendly bouncers, who we wished a Happy New Year on the way out), and having a long stretch of driving until the next levee on the list, we had a good opportunity to chat about the ins and outs of PEI’s draconian liquor laws, especially as we’d been in New Brunswick in early December, seeing a concert, at night, in a bar, and benefiting from that province’s more progressive attitudes (minors must be accompanied by an adult; that’s it). Miscouche was only a disappointment to us, of course: everyone of age, inside the levee, appeared to be having a good old time. The Kitchen Witch is a summertime restaurant and gift shop in Long River–I wrote about it when the business changed hands in 2008. A few years back it started opening up on New Years Day to host a levee. 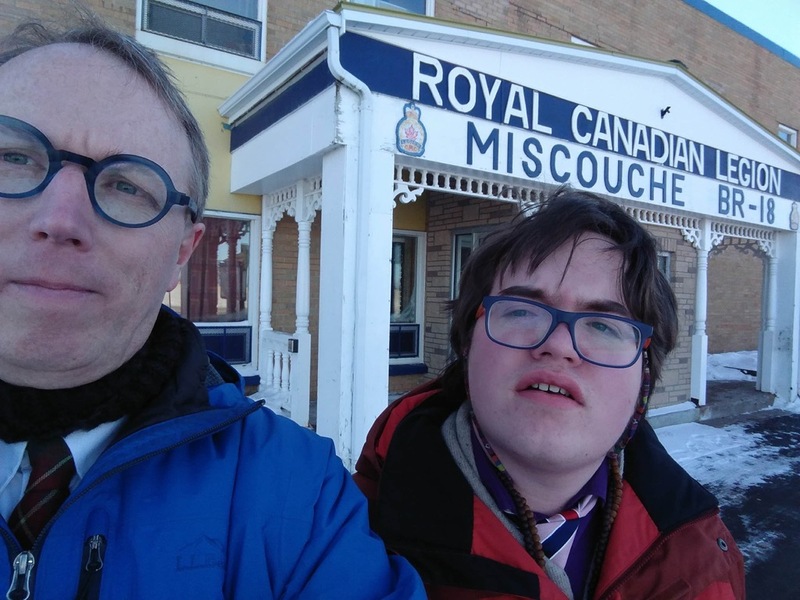 It was in exactly the right spot on our way from Miscouche to New London, and the warm reception we received from the extended family that wraps around it did much to stanch the disappointment of Miscouche. The food on offer was second-to-none: there was a special gluten free section, pots chili and soup, sweets and savories of all kinds, including some very good cheese balls and dips, and an especially interesting dish called “Texas caviar,” which, despite the name, contains no caviar at all (but does contain black-eyed peas, which, Texas lore says, it is good luck to eat on New Years Day). 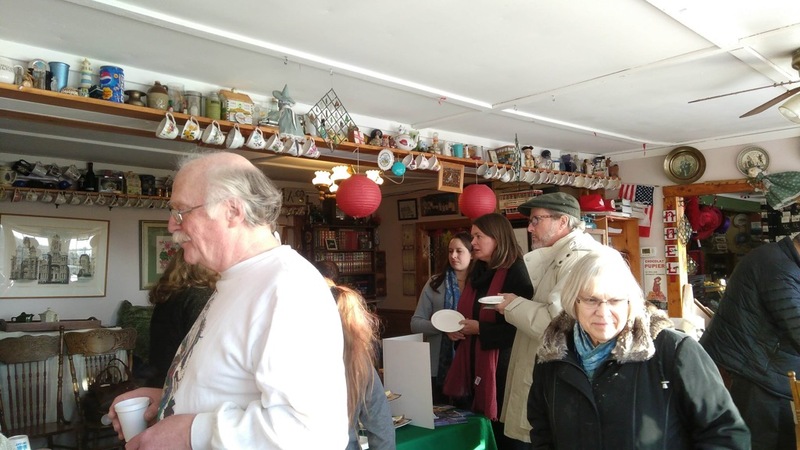 December 31, 2017 happened to be the first birthday of young Gemma, granddaughter of the owners, and so cake was offered up, as was a bowl of water for Ethan, and pleasant conversation with a diverse collection of north shore residents. This was the first year that the New London Community Complex levee appeared on the levee schedule, and I wasn’t sure what to expect. 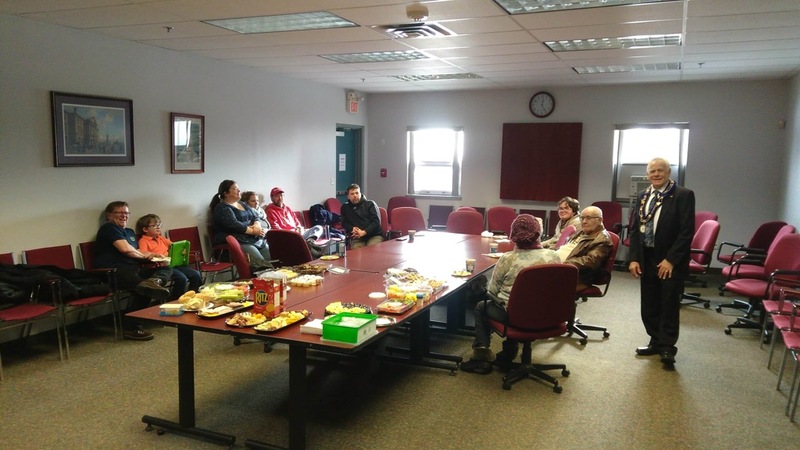 It turned out to be more in the Miscouche style than the Canoe Cove style: a “let’s continue the party from last night” rather than a “let’s greet our community together” opportunity. But they let us in the door, and although there was no food on offer, and we received instructions at the door to not let Oliver have anything to drink, we did enjoy a couple of songs from Midlife Crisis, the crack oldies band on stage providing the entertainment. So, perhaps not a highlight of the day, but a good pit-stop on the way from Long River back to town. By the time we got back to town it was just after 4:00 p.m., and we decided to make a quick duck into the Premier’s Levee in the Confederation Centre of the Arts. As we were late, this afforded us an opportunity to avoid the long lines that generally afflict this levee: we just marched right up to the starting line, were issued № 234, had our photo taken with the Premier and Duncan, shook the hands of the Liberal MLAs in the receiving line (including Hon. Tina Mundy and Chris Palmer, who we’d seen, hours before, in the receiving line in Summerside). Also as we were late, most of the food had already been gobbled up, so we reconciled ourselves to the crumbs that were left, and enjoyed chats with several of our chichi urban neighbours. I’m so happy that we took this year to see what levees look like outside of Charlottetown: we met many interesting people, had some good food and drink, got a solid tour of Central Queens and East Prince, and I learned a few things about how to make the levee schedule better for 2019. Written January 1, 2018 at 5:45 p.m.
Nice to have this rural levee review. I am sure this may encourage even more to participate... hint, hint (Eastern PEI). 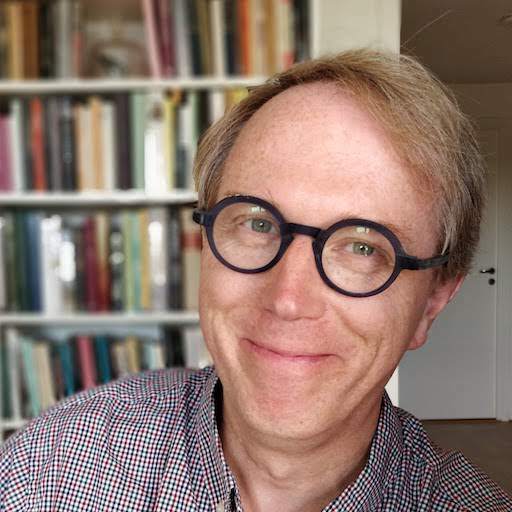 Thank you Peter for this review, it is interesting to read. I agree with you that the Liquor Laws in PEI are in serious need of updating, if compared to N.B. and Quebec. I thought maybe article 40.6 of PEI liquor laws about an adult parent or guardian present would void a refusal at the door. That was a lot of driving for one day but looks like an adventure. I was working as a volunteer at Fanningbank and must have shook hands with 500+ people in 90 minutes, too tired to go anywhere else afterwards. I don't know if as your neighbour I should be offended by your description of the chichi urban neighbours, LOL! Typo: "and then back around to Long Creek and New London." The Kitchen Witch is in the former Long River school. 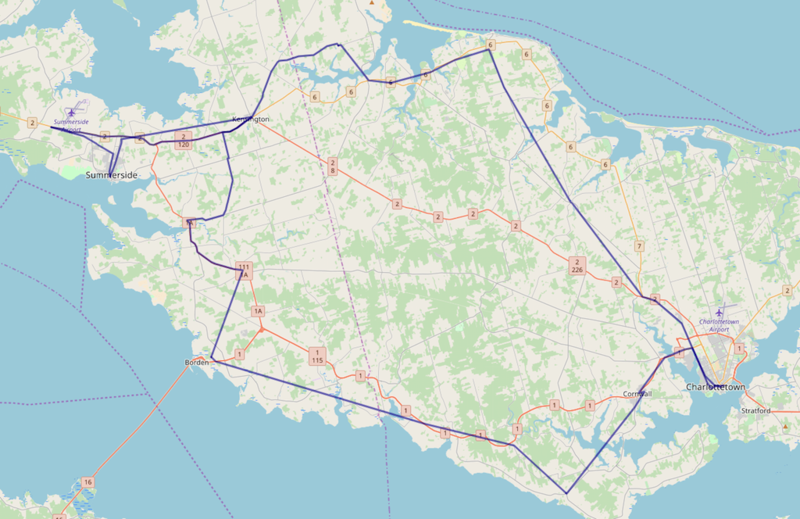 I don't know of any levees in Long Creek, which is near Cornwall. You’re right! Post-levee brain. On the way to Canoe Cove we passed through Long Creek, and I had that in my mind when I was writing. The Kitchen Witch is, of course, in Long River. Corrected. You Still have Long Creek on Most Musical Levee: New London Community Complex. Thank you, Oliver. I fixed that too.